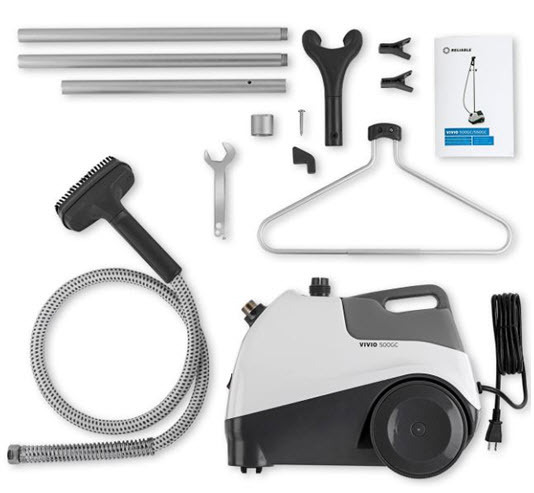 The Vivio 500GC was inspired by a simple desire to offer unparalleled ‘tough as nails’ performance in a commercial grade garment steamer within a beautiful exterior. Equally at home put to work in a retail-clothing store as it is in the master bedroom. The Vivio 500GC has the guts for your garment steaming glory. Buy it once and buy the best. 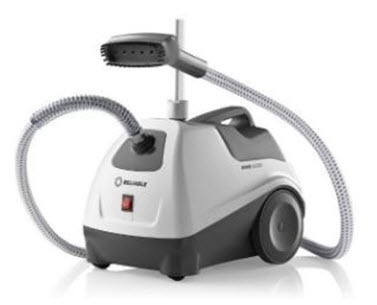 The Reliable Vivio 500GC professional garment steamer will not let you down. Delivering powerful steam and able to withstand the rigors of all-day, every day use – this is a powerful workhorse and a delight to use. 1300W brass heating element and solid brass fittings. Durable and dependable steam delivery. 1 gallon water capacity water bottle with anti-spill cap ensures no leaking during fill ups. Built-in hanger for steaming without the need for additional fixtures. Hanger can easily be removed. Large, no-skid wheels that allow for easy mobility for everyday use in the home or workroom. Thickest steam head on the market. Unique heat resistant steam hose cover adds safety and style. All Aluminum rod set supports the steam hose and garments.